For the last few years, Venerable Thay and the Vietnamese Buddhist community have opened Dinh Quang Temple to our Saturday meditations. This simple, generous act has had a profound effect on Ozark Dharma Community's trajectory. Every week, we’ve had a safe and peaceful place to practice. And every week, we've had a safe and peaceful place to grow. We've grown so much in size that it's time for a change of address: one that has more parking, a central location and easy access by bus. 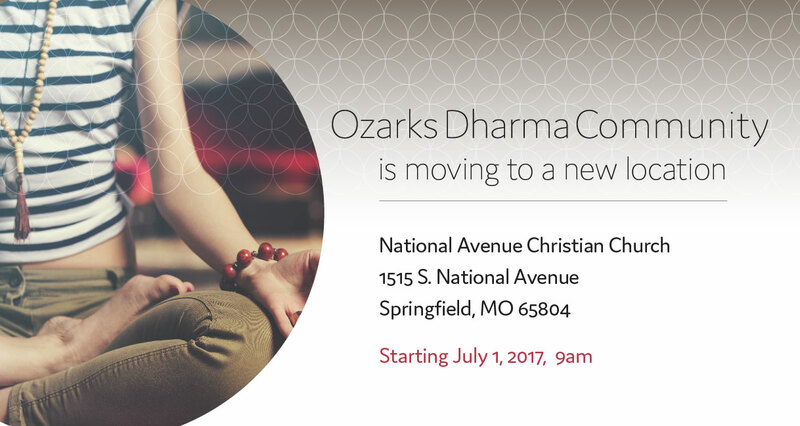 Starting July 1, 2017, our new home will be at National Avenue Christian Church near National and Sunshine at 1515 S National Ave, Springfield MO 65804. National Avenue Christian Church has a commitment to being open and inclusive. This dovetails with ODC’s own ideals to share and learn from the Buddha's teachings in a practical, non-dogmatic way. Our last meditation at Dinh Quang Temple is Saturday, June 24, 2017. We may be changing our address, but the temple -- and the generosity of the Vietnamese Buddhist community -- lives on in our hearts. A deep bow of gratitude to our spiritual friends and gracious hosts. NOTE: Our new cushions & mats are still on-order. So if you have your own cushion and blanket, please bring them to sit on when we meet at National Avenue Church starting July 1.